It was a tad cool this morning, -7, so when I trudged out to the chicken coop to set up my GoPro, I also brought along a bottle of bubbles. 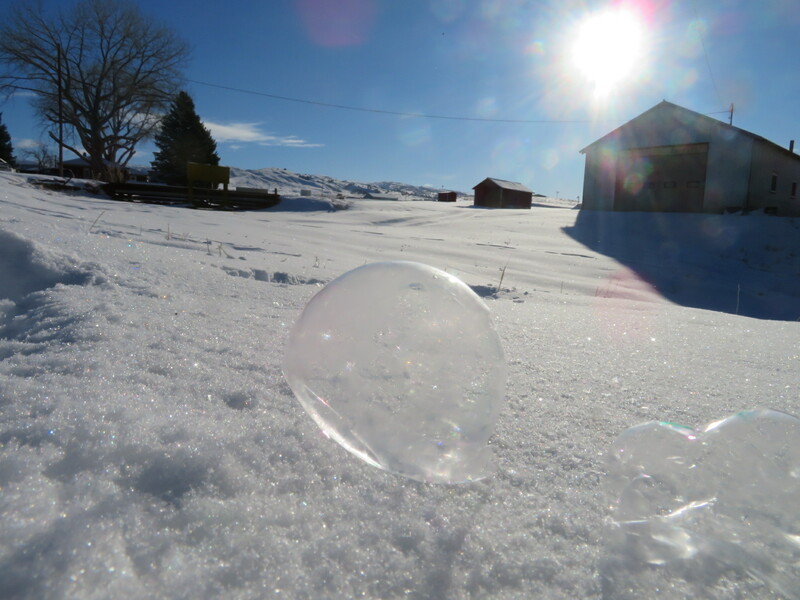 For you, a pretty cool photo of a frozen bubble on the snow… and, yes, I’m looking over my GoPro video to see if there’s anything on it! Great photo. I enjoyed your video that I picked up on Twitter. What fun that must have been. Bottles of bubbles are a must with little ones around. Though I like to blow them on my own and enjoy the colours before the GKs chase and burst them. That is really “cool”!! I had no idea that would happen. Thanks, Carol. Wonderful. I have wanted to try it too. Someone said to put corn syrup in the bubbles to make them ‘tougher’.